Next generation peptides reduce fine lines and wrinkles while stem cells and growth factors increase firmness and elasticity. A clinically advanced rejuvenating eye treatment. 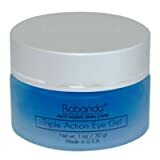 Cutting edge eye gel which strengthens, firms and lifts the skin around the entire eye area. Formulation utilizes the latest science, combining proven ingredients in a single product that can be applied directly to all areas around the eye, including the eyelid, to treat all the common concerns of the aging eye area and achieve dramatic results rapidly. Its light gel texture is excellent for all skin types. Myristoyl Nonapeptide-3 – peptide that provides similar benefits as vit A without irritation, reducing fine lines and wrinkles, and making the skin smoother and brighter. Niacinamide, Fraxinus Excelsior Bark Extract and Silanetriol – reduces eye puffiness, dark circles and under-eye bags while providing antioxidant protection. Citrus Aurantium Dulcis Callus Culture Extract (Orange Stem Cell Extract) – strengthens skin structure to maintain healthy, youthful skin; organizes and firms the skin to reduce the appearance of fine lines and wrinkles. After cleansing and applying any PCA SKIN treatment serums, pat a small amount around eye area and directly to the eyelid twice daily. Follow with the appropriate PCA SKIN broad spectrum SPF product in the daytime or moisturizer in the evening. PCA SKIN Rejuvenating Serum, 1 fl. oz.